"Thanks for your help. I was very pleased with your response over the phone. You appear to be in this business for the right reason and not for profits. This has been a hard time for us, and your empathy for the situation is appreciated. 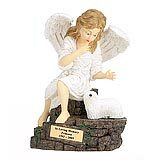 I am impressed with the quality of the Urns for Cindy. Thank you for making this bad situation as pleasant as possible." 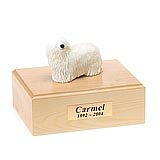 All available Komondor dog urns and memorials will be displayed with the figurine on the Komondor urn you select and in the appropriate size.